This past weekend, a pair of restaurant openings got us all riled up about the rich seafood traditions of Sinaloa (not that you needed a reminder in the first place). Chef Ninive Vargas, who recently closed La Puente’s El Cristalazo, debuted El Marinero in Fontana; and Alonso Arellano—owner of Rocio’s Moles de Los Dioses which, as you’ll likely recall, was destroyed by arson—comes in with Centro Botanero Mazatlan. Let’s take a look. 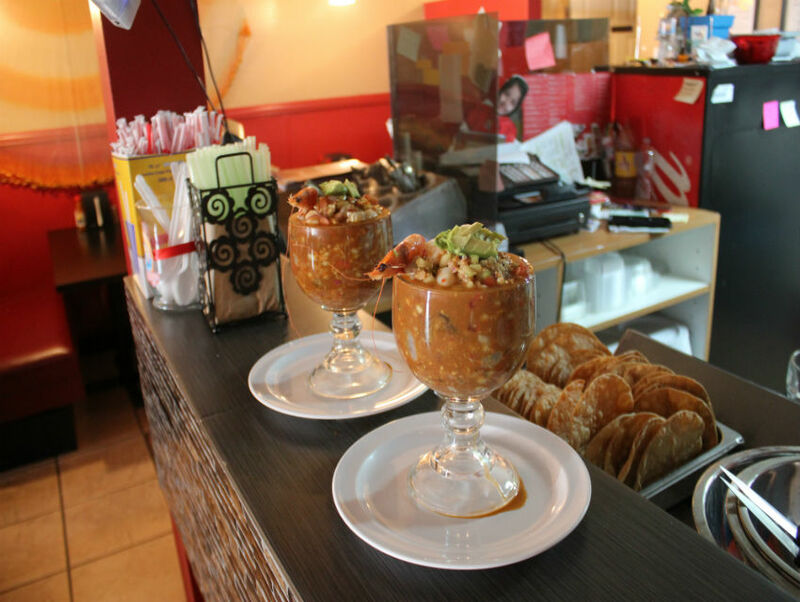 Good news: The amazing Escuinapan cuisine found at chef Ninive Vargas’ backyard La Puente restaurant, El Cristalazo, is basically the same at the newly opened El Marinero—plus they’ve acquired a liquor license. That means micheladas and chabelas will now be on the menu, as well as the simpler pleasures of beer and ceviche, which is a basic human right. Bad news: It’s in Fontana. Fontana?!? Seriously? Might as well be Blyth. How am I ever going to make it out there if La Puente was already a mission? Have no fear Angelenos: In addition to having a required stop on the way to Palm Springs, word on the street is that Vargas is looking at a scaled down version of El Marinero in L.A.
Alonso Arellano and his wife, Elsa—also a partner of the shuttered Rocio’s Moles de Los Dioses—have opened a small Mexican seafood concept a few doors down from the damaged space. It has six seats inside, a few tables outside, and its all about featuring the flavors of Mazatlan. The restaurant will serve ceviches, botanas (snacks), a few cooked dishes, and micheladas from the counter prepared by a new cook the pair has acquired from Mazatlan. Look for green and black aguachiles, clamatos, ceviches, and camarones a la diabla (spicy shrimp) served into to go containers because there’s no wait staff.